Any way, I have a new post up at Mad Genius Club this morning. Go check it out. I’ll be back later today or tomorrow with a real post. I promise — muse allowing, of course! 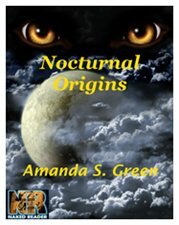 First off, I want to thank everyone who’s already bought Nocturnal Origins and I hope you’ve enjoyed it. I’d appreciate it if you’d consider posting reviews on Amazon and Barnes & Noble. This next bit is where I need your help. Promotion is not my strong suit and it is something every author has to do. Part of what someone suggested — yes, Sarah, you know I’m talking about you — is for me to do a blog tour. So, here’s the big question and favor. If you know of a blog, or blogs, that might be good ones for me to approach about doing a guest blog, leave a comment here or on facebook. If you have a blog you’d consider letting me do a guest post on, let me know. I promise I’m housebroken and I won’t leave too big of a mess behind when I leave. Like everyone, I wear a number of different hats in my life. I’m mother and daughter. I’m writer and editor. I’m handyman and janitor, jack-of-all-trades, teacher and enabler I am, despite sometimes doubting it, human. Unfortunately, all those hats have been demanding more than their fair share of attention of late. As a result, my writing has taken a backseat. It is so easy to postpone it, telling myself I’ll get to it later in the day. Then later comes and I’m exhausted from all the battles of the day — which has included an ongoing battle with my internet/phone/tv provider for the last three months — so I tell myself I’ll write tomorrow. Now the only question is which of the current projects to complete. Do I finish the lighter urban fantasy or the historical fantasy, the space opera — which I haven’t snippeted here — or the sequel to Nocturnal Origins? Or do I start something completely different. Hmm….that’s the question. Hopefully, while doing the latest round with the internet folks this morning, the answers will come to me. It was best not to think about that now, however. Several of the priests assigned to the cathedral were sensitives. Of them, some already plotted against him. He knew it. Just as he knew they were jealous. Jealous of how God favored him. Jealous of his relationship with the Royal Family. Because of that, Rasputin couldn’t allow himself to become careless. He’d play their games and be patient until the day came when he could finally show them just how dangerous it was to attempt to undermine him. Ah for the days when Spring Break meant running away to the beach to lie in the sun or the mountains to ski. But those days have been gone for mumble-mumble years. The last few days, instead of playing — or writing — I’ve been trying to help my son figure out how much he has lost when his dorm room flooded and to pull together receipts, replacement cost estimates, etc. Needless to say, as stressful as it’s been for me, it’s worse for him. But, the stress has kept me from focusing on my job as editor at NRP and on my writing. I’ve got three projects right now I want to be working on, but I just can’t concentrate enough to do it. In fact, I realized a few minutes ago just how stressed I still am when, as I tried to start the next chapter in one of the projects, I found myself reaching for chocolate. Now, that wouldn’t be unusual if it was mid-afternoon. That’s called a snack. But it is only a few minutes past 0930 right now. Too early to drink and too early to be eating chocolate…because, if I start eating that wondrous food of the gods this early, I’ll be eating it all day. So, since it looks like the writing is going to be delayed at least a bit longer today, here’s the next scene from Nocturnal Serenade, the proposed sequel to Nocturnal Origins. It’s rough, but I hope you’ll enjoy it. And remember, you can find Origins here, or at Amazon or Barnes & Noble. Flashing lights from half a dozen emergency vehicles greeted her as she rounded the corner. A marked police unit blocked the road ahead. Two officers huddled inside yellow slickers as rain beat down on them. She didn’t need to see their expressions to know they’d much prefer being warm and dry inside their squad car. Even so, they stood their post, making sure the curious didn’t get too close to the crime scene. That was important, especially since the media had already descended upon the scene. Not that it surprised her. Murder in suburbia, even if this middle-class neighborhood was technically inside the Dallas city limits, made for great press, especially if the media found some way to add controversy to the story. It was up to her and her team to make sure that didn’t happen. Lightening streaked across the early morning sky as she parked two houses down from the crime scene. A rolling crash of thunder followed almost immediately. The reporters and curious neighbors shuffled around behind the barricades, casting disgusted looks skyward. They might be cold and wet, but their morbid curiosity overrode physical discomfort. Lt. Mackenzie Santos ignored the questions shouted at her just as she ignored the rain beating down on her. Long legs carried her down the street in quick, confident strides. She flashed her badge at the young cop in her path before ducking under the yellow crime scene tape. The press would have to wait until she figured out what was going on for a statement. Even then, she’d do her best to avoid answering their questions. She was damned if she’d feed the vultures unless he absolutely had to. “Burke, what have we got?” she asked the uniformed officer who greeted her just inside the house. Mac nodded and looked around the front room, what she assumed was the den. Comfortable furnishings, a bit warn but still showing good workmanship and quality. Pictures and photos in various sizes and types of frames graced tabletops and hung on walls. This was a home where family was important. So what had happened? Mac took one more look around the room before motioning for Burke to take her to the body. Whether the body in the back room belonged to the homeowners’ son or not, the house would never be the home it had been. That sense of safety, of being a haven from the rest of the world had been shattered just, she feared, as the family would soon be shattered. Mac paused just inside a small bedroom. As she did, she swallowed convulsively. The fingers of her right hand absently closed about the small jar of Vicks in her pocket and she dabbed some inside her nose. The burning of the menthol was a small enough price to pay to make the odors of filth and decomposition, odors she’d give almost anything never to smell again. But she knew that wasn’t going to happen. More than ten years with the Dallas Police Department, the last three and a half as a homicide detective, had taught her that. For several long moments, Mac stood still, her green eyes taking in every detail of the room. The unmistakable smell of death permeated the air. Mingling with it was the sickening odor of burnt flesh and, beneath that, the faint odor of marijuana. Whatever she’d been expecting, it wasn’t this. Shadows hung heavily in the room. Dark drapes covered the windows and the only light came from light overhead. A lamp that had been set on the bedside table lay on the floor, its bulb smashed. Next to it rested a small clock, its display dark, the cord ripped from the all. If it weren’t for the body in the middle of the room, Mac would say someone simply hated to get up in the morning. For now, however, the investigation centered on the body of the young man slumped against the ropes binding him to a wooden chair Mac assumed had come from the dining room. Who was he and what had he been – the son who was supposed to be house-sitting, or someone else? Or was he something else, something that would make the investigation into his death much more complicated than she first anticipated? The blonde detective kneeling carefully next to the victim looked over her shoulder at the sound of Mac’s voice. Her blue eyes and closed expression betrayed an anger Mac recognized and understood. Her partner was no more desensitized to death, especially senseless death, than was she. And that anger spoke volumes just then. Something about the scene, or the victim, hit home with Sergeant Patricia Collins and the possible explanations worried Mac. “Sorry to call you out, LT, but this one just doesn’t feel right,” Pat commented as she climbed to her feet and carefully crossed the room to where Mac stood. As she did, she peeled off the protective gloves she’d been wearing, turning them inside out and tossing them into the sack by the door to be collected by the crime scene techs later. “But?” Mac prompted. Pat wouldn’t have called her to the scene if it were that simple. Mac drew a deep breath, held it for a moment, and then exhaled slowly. While she appreciated the fact Pat wasn’t jumping to conclusions, a hint of frustration crept in. Her partner needed to start trusting her own instincts. After three months with the squad – and almost as much time on the force as Mac – Pat shouldn’t be second-guessing herself. And the only way for her to stop doing just that was to handle and investigation without Mac there to coach her at each step along the way. Then another possible explanation for Pat’s request dawned on her and Mac paled. Her heart seemed to skip a beat and her breath caught. No, it couldn’t be. Pat would have found some way to warn her. Wouldn’t she? Of course, she would have. If one of their people had been involved, Pat would have made sure Mac knew it. She wouldn’t play that sort of guessing game with her partner, her fellow pride member. There was too much at stake to risk a non-Shifter figuring out what they were, especially after all that had happened over the last few months. Pushing down the quick flare of panic that started in the pit of her stomach and threatened to erupt in a cry of distress, Mac once more turned her attention to the scene before her. As she did, she dug deep inside, calling on her jaguar. Almost instantly she felt her cat there, just below the surface. The smell of death and the sight of the body called to the jaguar and Mac quickly reinforced her control. She couldn’t risk shifting but she wanted the added sensitivity the jaguar gave her. Even so, she couldn’t stop the growl deep in her throat, a growl that had Pat looking over at her in quick concern. A quick sniff, then a second and Mac relaxed a little more. All the expected smells were there. Blood, other bodily fluids best left unsaid. Acrid perspiration. Burnt flesh. The stale smell of smoking, both of legal tobacco and illegal pot. All expected based on what she’d seen so far. More importantly, nothing to indicate another shifter had been involved. Relieved, Mac moved forward, carefully watching where exact step went. The last thing she wanted, or needed, was to contaminate or destroy any evidence that might help them close the case. A moment later, she knelt in almost the exact place Pat had earlier. Without touching the body, she carefully examined it, quickly understanding why her partner had sent for her. Mac nodded and continued her examination. If she had to guess, she’d say the victim was around twenty. Dressed in only in a pair of jeans, it was easy to see how much he’d been forced to endure before he died. His chestnut colored hair appeared to have been recently barbered. An expensive watch was still in place on his left wrist. Obviously, theft wasn’t the motive for the murder. If it had been, the watch, laptop computer on the desk under the window and numerous other easily portable items would have been taken. Mac had seen enough of the rest of the house when she arrived to know the other rooms had been undisturbed. So the victim hadn’t been dead for long. Certainly not more than a day or so, no matter how many papers had been allowed to pile up on the front porch. Good neighborhood or not, scavengers were always around and they rarely, if ever, turned away from an easy mark. And there was no easier mark than a dead man. After pulling on a pair of protective gloves, Mac reached out and carefully tilted the young man’s head up some. The sight of his face, bruised and bloodied beyond recognition, had her closing her eyes and offering up a quick prayer for that he had passed out before most of the damage had been inflicted. Someone had used their fists and a knife, or some other sharp implement, to inflict the most damage possible. How the neighbors hadn’t heard him screaming in pain was beyond her. With that, Mac continued her examination of the young man. The fingers of his right hand looked as if they’d been broken. More blood streaked his chest and abdomen. Whether it was from the injuries to his face or from injuries to his torso, she couldn’t tell. She’d have to wait on the ME for that. But she did recognize the small, circular burns that covered seemed to run down his neck. More were visible on his arms and upper chest, even his feet. Someone had done a job on him and hadn’t stopped there. Wrapped about his left bicep and then loosened slightly was a thin black belt. A syringe hung precariously from the inside of that elbow, a small drop of blood pooled around the needle. Since she saw no other indication he was a user, Mac wondered what he’d been given and why. Most of all, she wanted to know by whom. For a moment, Pat simply stood there, her expression blank. Then she stared at Mac in disbelief. Clearly, she’d expected her partner to remain on the scene, possibly even take charge of the investigation. Well, it was time for Pat to learn she didn’t need her partner with her all the time. She was a good cop. If she weren’t, she’d never have lasted as long in Narcotics as she had. But now she needed to gain the same confidence in Homicide that she’d had as an undercover cop and Mac was determined to help her get it – whether Pat thought she was ready or not. Pat paused and Mac could see all the questions in her partner’s eyes, questions Pat fought to keep from asking. Understanding, remembering the first time she’d been given the lead on a homicide investigation, Mac relented a little and motioned for Pat to come with her before turning and quickly making her way outside. “All right, Pat, just say it,” she instructed her partner once they were safely inside Mac’s Mustang and away from the gawking neighbors and reporters demanding to know what was going on. “Mac, have you lost your mind?” Pat swiveled in her seat so she faced Mac and there was no mistaking her disbelief or her concern – or even the slight trace of fear – that touched her voice. “Nope. Not at all.” Now Mac grinned even as she slid the key into the ignition and started the engine. “Pat, you’ve run undercover ops that would turn my blood cold. You know what to do and you shouldn’t be having second thoughts about it now. So run the on-site investigation. I’m as close as the phone if you need me. Mac waited, giving her partner time to digest what she’d said. As she did, she checked her watch and grimaced slightly. In less than an hour she was due at the Chief’s weekly briefing. She’d be expected to report on the current caseload of her squad as well as explain why there were still outstanding cases. Not that anyone actually expected the squad to close each and every case that came in. Dallas was too big, the crime rate too high and there were too many unidentified victims for that to ever happen. Even so, the pressure was still there to explain why cases weren’t moving any quicker than they were. Face facts, Mac. You’re just as uncomfortable with your new role as squad commander as Pat is with hers as a homicide detective. Politics has never been your strong suit. For a moment, the blonde said nothing. Then she nodded once, emphatically, before reaching for the door handle. A moment later, with Pat striding across the front yard toward the house, Mac pulled away from the curb and sped off. As she did, she frowned. She’d much rather stay on the scene and work the case. But she couldn’t. With the promotion to lieutenant came the added responsibilities of squad commander. That meant she had to make her appearance at the Chief’s weekly briefings – whether she liked it or not. Maybe she’d get lucky and something would break with this case or one of the others her squad was working, requiring her to leave the briefing before the Chief got to her. With that happy thought in mind, Mac contacted Dispatch to let them know she was on her way to the Justice Center.